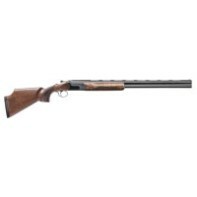 Any wingshooter, trap shooter or sporting clays enthusiast will appreciate the Charles Daly® 214E Over/Under Shotgun. Made to be functional and attractive, these shotguns feature beautifully finished receivers, a fine metal to wood fit, smooth actions with interchangeable Rem® threaded choke tubes. The Charles Daly® 214E features single selective trigger controlled by the top safety and ejectors. Hand Oiled Checkered Walnut LOP: 13.5" DAH: 3.35" DAC: 1.5"